The mod works! But I have a problem here, I'm not able to configure de shaders to look like in the pics you posted. Can you help me please? How did you set the configuration? 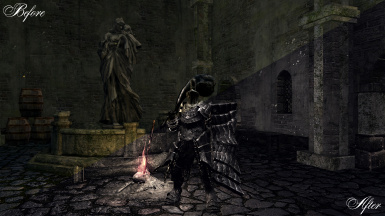 It`s Havels Weapon which you can find in a treasure behind a secret wall in Anor Londo..just google Havels equipment. 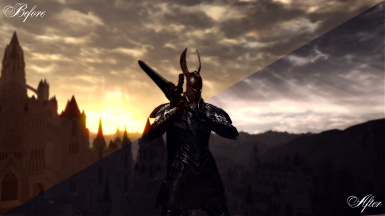 What settings did you use with the picture at Firelink? 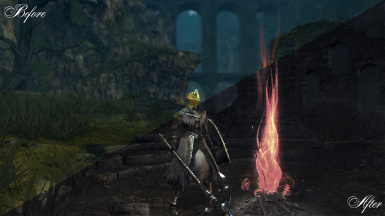 The bonfire is so visible compared to everything else. does it go in the dsfix? or just the dspde/ data? i guess this is a nice mod for some people... i can just turn vibrancy or saturation down in nvidia control panel though for a similar effect and not get a performance hit. It works but i cannot make it look good! What settings were you using when you took the printscreens? 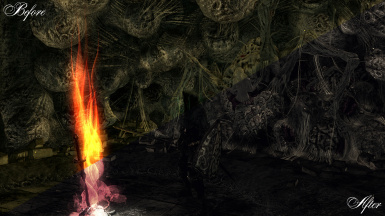 I really really like the idea by LordDeBahs of it only being darker when hollow. More variety in what you see and it actually makes sense too. Shouldn't be too hard to program i think, just disable the filter when hollow. edit: Nvm it works, I think nexus corrupted something in the dsfix files as i re-downloaded both mods and they work fine with each other now. Seems to me that if you disable technicolor and sepia you get color reproduction pretty close to vanilla.